On some occasions, the rose-tinted lenses observing our musical pasts may cloud judgement, and their hazy lingering phantoms may appear more brilliant in memory than reality would reflect. On others, however, memory can be granted context that, in isolation, would never have been able to reveal its true brilliance until later. 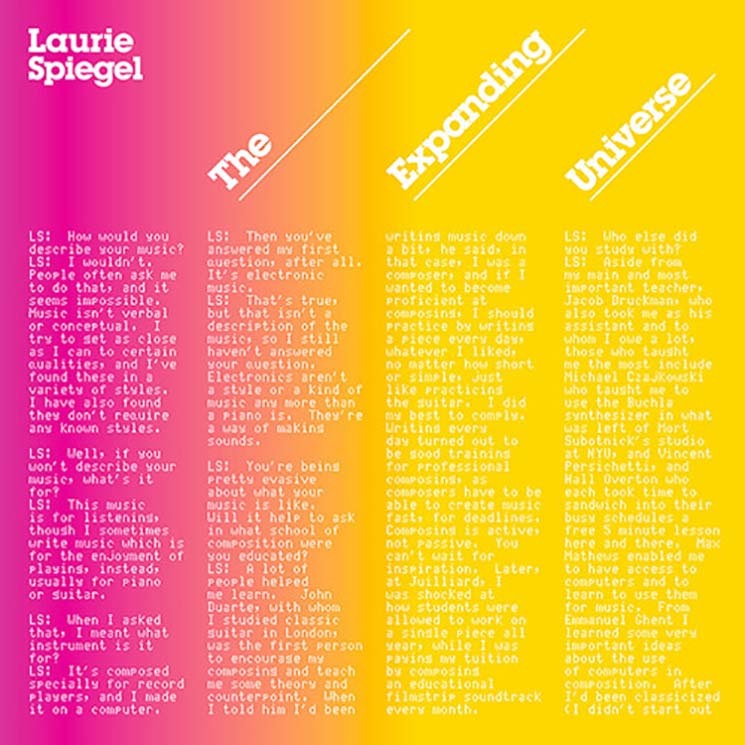 Now, Laurie Spiegel's The Expanding Universe can be firmly affixed in the pillars of electronic music history. In this case, looking to memory is the wrong approach, because The Expanding Universe tells a story that stays relevant to the present day, and looks boldly to the future. It makes sense, then, that The Expanding Universe would have been composed at a site of great technological innovation. Bell Telephone Laboratories was Spiegel's proverbial home during the 1970s. There, Spiegel made it a point of conjuring life from machines. Created by Richard Moore and Max Matthews, the GROOVE (Generated Realtime Operations On Voltage-controlled Equipment) system was Spiegel's primary tool. An analog-digital hybrid where limited computing power was used to store parameters, rather than generating the sound itself, an idea that is prominent in modern electronic music synthesis. All of this may have you believe that The Expanding Universe would be nothing more than an experiment. In its over two-and-a-half hour runtime there is a consistent emotional sensitivity. Moments of deep introspection, as in the truly monumental title piece, are present in abundance. Sonic textures that envelop your ears and stimulate your nerve endings are par for the course in Spiegel's repertoire. Equally stunning in similar approach is "The Unquestioned Answer," whose ponderous sensitivity reflects the human obsession for making sense of the unknown. Indeed, there are even concrete seeds of modern ambient music already being sown in The Expanding Universe, with music like "Pentachrome" and "East River Dawn" descending into coloured opacity and murk. Present too is endless melodic experimentation. "Patchwork," the aptly named opening track on both the rerelease and the original, is alive with personality and quirk, almost rousing images of a scientist lost in a sea of wires. The three Appalachian Groves tease and delight with curiosity and playfulness, and "The Orient Express" looms with foreboding ominousness. There is, too, rhythmic innovation, which is remarkable in its own right. A good ten years before techno was even conceptualized as a genre — less so minimal techno — "Drums" and "Clockworks" painted early pictures of what we'd be hearing years later.